Cowcaddens (Scots: Coocaddens, Scottish Gaelic: Coille Challtainn) is an area of the city of Glasgow, Scotland. It is very close to the city centre and is bordered by the newer area of Garnethill to the south-west and old Townhead to the east. Cowcaddens was originally a village and became an industrious and thriving part of the expanding Glasgow, being close to Port Dundas and the Forth and Clyde Canal immediately to its north. 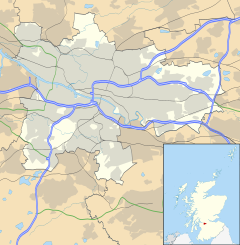 Its boundaries merged into the City of Glasgow in 1846. By the 1880s, the area was becoming a slum district with the highest level of infant mortality (190 per thousand births) in the city, a figure which was three times that of the West End. The southern fringes of Cowcaddens have historically housed one of Glasgow's premier entertainment districts, with theatres and music halls including the former Scottish Zoo and Hippodrome in New City Road, the Grand Theatre at Cowcaddens Cross, Theatre Royal at the upper end of Hope Street, the massive Cineworld multi-storey cinema complex and the Glasgow Royal Concert Hall at the top of West Nile Street. The Royal Scottish Academy of Music and Drama, now known as the Royal Conservatoire of Scotland is in Renfrew Street at its junction with Hope Street. From 1957 to 2003, the headquarters of STV were located there - having since relocated to Pacific Quay. Two other former theatres, the Royalty Theatre and the Glasgow Apollo (now occupied by the Cineworld complex) used to stand close to the area. The former Cowcaddens Free Church now houses the National Piping Centre. Glasgow Caledonian University is nearby. Cowcaddens is served by Cowcaddens subway station on the Glasgow Subway system, and by bus services through it and emanating from Buchanan Bus Station. ^ Scott Graham - ABACUS. "TGS - 1830s to 1914 - Neighbourhoods - Cowcaddens". theglasgowstory.com. ^ "The Scottish Zoo and Variety Circus, and Glasgow Hippodrome, New City Road, Glasgow". Arthurlloyd.co.uk. Retrieved 2018-12-28. ^ "The Milton Colosseum, Cowcaddens Cross, Glasgow". Arthurlloyd.co.uk. 2008-05-28. Retrieved 2018-12-28. ^ "Maps & Stations - SPT". spt.co.uk. ^ "Cowcaddens Underpass Art". glasgowcanal.co.uk.